by Jeffrey Lang Victor Von Doom's lab notebooks - instructions for how to build a machine that can pierce the veil between Earth and the netherworld -have fallen into the wrong hands. A gate is opened where none should exist, and something has invaded our world. 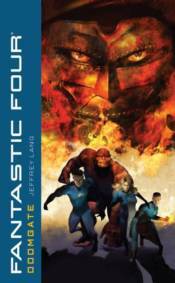 The Fantastic Four would be the team to face such a threat - if they could reach one another. Force shields erected around Manhattan have trapped Reed Richards, Sue Richards, Ben Grimm and Johnny Storm, and all are in danger of succumbing to the effects of the energies emanating from the dark dimension, forcing the Fantastic Four to seek aid from their greatest enemy, whose nefariously brilliant mind first conceived the Doomgate!